It feels like a dream, better than a dream! 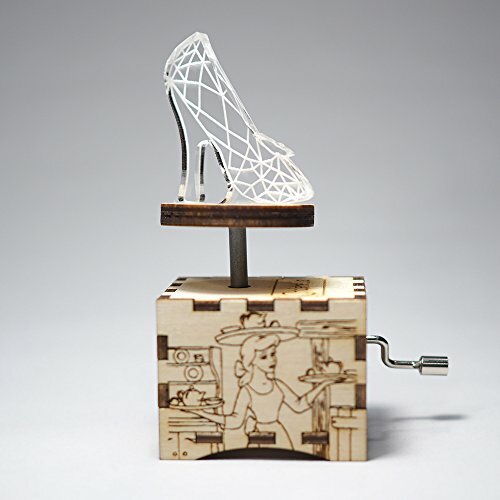 You don't need to fit in a glass slipper to get this music box!!! Song: A Dream Is A Wish Your Heart Makes. Includes spinning attachment with Glass Slipper. Laser engraved and cut hand-cranked music box. This original crankshaft mechanism has been placed in a natural wood box that has been designed by Quetzal Studio. Hand crank the handle to play your favorite song. Enjoy and share the magical notes with your friends and family, by placing the instrument on a hard surface like wood, glass, etc. and turn the crank clock-wise. ►WANT TO MAKE IT SPECIAL? Make it a very special gift for any occasion: birthdays, baby showers, bridal showers, anniversaries, engagement, Valentine's day, Christmas, family reunions, graduations or as thank you gifts or get well gifts as well! Please click on ""Select Options"" above the Add to Cart Button and select ""Bottom Engraving"", then enter your desired text exactly as you want it engraved. Due to the nature of the wood grains, every wooden boxes wood grain will vary slightly from the items shown in the pictures. If you have any questions about this product by Quetzal Studio, contact us by completing and submitting the form below. If you are looking for a specif part number, please include it with your message. Custom engraved wooden ballerina, ballet dancer music box, personalized with a name on top and for a special request the bottom side of the box as well. Great gift for daughter.